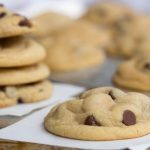 Who knew vanilla instant pudding could be such a killer secret ingredient to THE perfect, MOST chewy, absolutely softest and best chocolate chip cookie recipe?!?! I made these cookies for church yesterday and they were a HUGE hit! 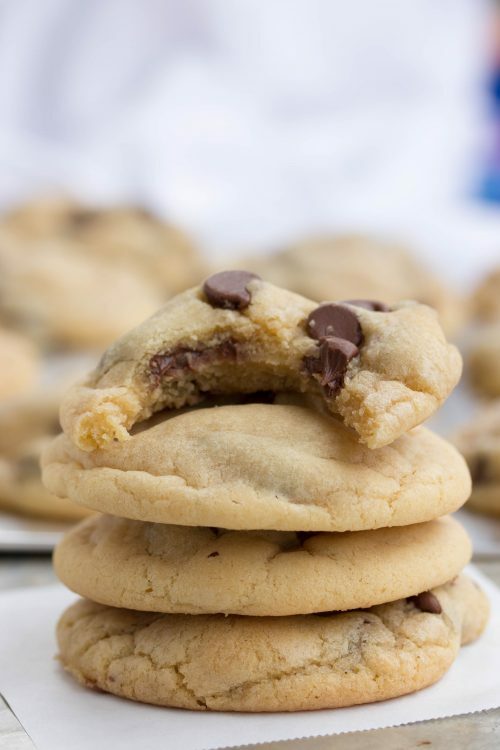 I’ve been playing with this recipe for a few months now and wish I could say it only took me only a couple tries to create an easy, fool proof chocolate chip cookie recipe that was addicting. Well, it didn’t. I have attempted these cookies at least 5 or 6 times with different techniques like cold butter verses room temperature butter verses melted butter (melted butter won, BTW). OR with 2 eggs verses 3 eggs and different measurements of flour to even out the additional dryness of adding instant vanilla pudding. Well, I’ve finally figured it out and can’t wait to hear your feedback! First, do NOT over-bake! The cookie should only bake until there is a hint of golden brown and then removed from the oven. If you’re unsure about the color, I would error on the side of slightly under-baking these bad boys and go by your kitchen timer (8 to 10 minutes only). Once removed from the oven, allow them to completely cool down on the baking sheet. This will allow them to continue to baking process from the heat of the baking sheet while slowly cooling down. Second, the butter temperature DOES matter! Like I mentioned, I’ve tried the butter cold, room temperature, melted, and hot. The butter needs to be melted (with still a couple chunks of solid butter floating in the liquid butter) and cannot be hot at all. I found microwaving cold, refrigerated butter for 30 to 40 seconds or room temperature butter for 20 to 30 seconds is about the perfect time. However, microwaves are also different for us all so I recommend melting your butter in 10 second increments to find the perfect timing for you and your microwave. Again, make sure you don’t overheat that butter. Phew! Are you ready to try them now? Like I mentioned, I’ve been bombarded with requests for this recipe and look forward to hearing your feedback! I hope they’re as successful for you as they were for me! 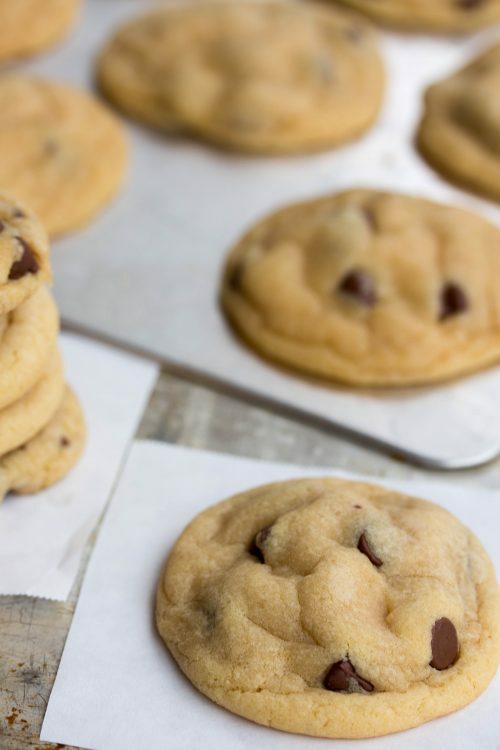 This ooey-gooey, soft, easy, and chewy chocolate chip cookies with vanilla pudding recipe will quickly replace your current go-to chocolate chip cookie recipe. These really are THE best cookies! Preheat oven to 350 degrees F. Microwave butter in small microwave-safe bowl for about 30 to 40 seconds JUST until it's barely melted (almost completely liquid form with a couple chunks of solid butter remaining). It should not be bubbling or hot. In a standing mixer, beat together butter, sugar, and brown sugar until smooth and creamy. While beating, add eggs one at a time. Add vanilla. Beat for additional 10 to 15 seconds ONLY until mixed well. In a separate large bowl, sift together flour, vanilla pudding, baking soda, and salt. Add flour mixture to the standing mixer and mix until dough forms. Add chocolate chips and mix well. Roll into 2 inch balls and place evenly spread out on baking sheet. 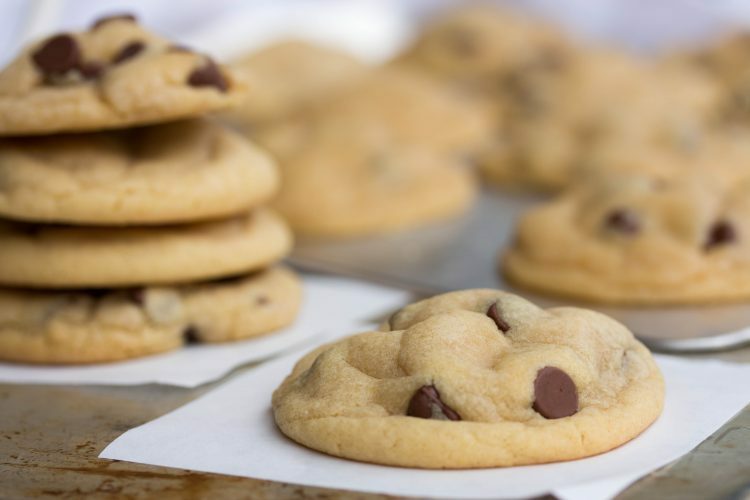 Bake cookies for 8 to 10 minutes just until tops are BARELY golden brown (really... just a little kiss of golden brown). Remove and allow to cool on baking sheet for 15 minutes until cookies are cooled. Do NOT over-bake! The cookie should only bake until there is a hint of golden brown and then removed from the oven. If you're unsure about the color, I would error on the side of slightly under-baking these bad boys and go by your kitchen timer (8 to 10 minutes only). Once removed from the oven, allow them to completely cool down on the baking sheet. This will allow them to continue to baking process from the heat of the baking sheet while slowly cooling down. Second, the butter temperature DOES matter! Like I mentioned, I've tried the butter cold, room temperature, melted, and hot. The butter needs to be melted (with still a couple chunks of solid butter floating in the liquid butter) and cannot be hot at all. I found microwaving cold, refrigerated butter for 30 to 40 seconds or room temperature butter for 20 to 30 seconds is about the perfect time. However, microwaves are also different for us all so I recommend melting your butter in 10 second increments to find the perfect timing for you and your microwave. Again, make sure you don't overheat that butter.